Dubai, UAE, January 30, 2019: From February 1st-10th, visitors to The Dubai Mall can explore China’s traditions and culture through various art forms as Chinese New Year celebrations come to life. 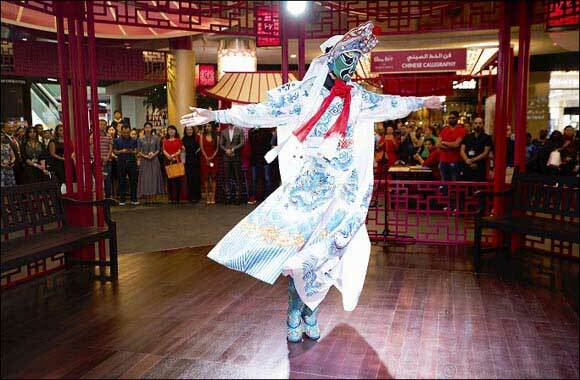 Under the theme China Art, the mall will offer an exciting programme of authentic activities showcasing art, music and dance through arts & crafts workshops, traditional Chinese games and exciting live performances. The hub of activity will be in Star Atrium, where a highly decorative red pagoda will host a daily programme of traditional Arts & Crafts including Chinese finger palm painting and calligraphy, egg carving, umbrella art painting, knot tying, Chinese lucky bag making and wood carving pen workshops. Demonstrating the craftsmanship of skilled artists from China, visitors can also take home one of these customised keepsakes by spending a minimum purchase starting from AED150 at any store in the mall. In addition, a green screen photo booth will offer guests the choice to pick from a series of backdrops from China or Dubai, for an Instagram moment. Timings for all arts & crafts will be from 10:00am – 11:00pm. Starting from late afternoon, the Star Atrium will be buzzing with exciting live cultural performances, creating a celebratory atmosphere for all. The line-up of entertainment includes a Chinese Parade, Chinese Mask Changer, Chinese Puppet & Calligraphy plus live musical performances using traditional Chinese instruments. In addition, roaming characters from Chinese folklore and myth will bring guests good fortune and a great photo opp. Timings for the live performances can be found below. In Fashion Avenue Atrium, a giant red wishing tree will create a beautiful setting for a gaming area featuring some popular, yet traditional Chinese games. Here, guests can enjoy a friendly game of mahjong or Chinese checkers or watch and observe others play these highly strategic games. Visitors can also enjoy live performances at Dubai Aquarium from February 4th-6th where divers will be performing an underwater dragon dance daily at 12:00noon, 3:00pm and 6:00pm. Dubai Ice Rink will also feature an exclusive performance of the dragon dance on ice, during the same period at 5:00pm daily. Chinese shoppers using Alipay for their purchases will benefit from a number of promotions, including cash-back incentives, a gift with purchase or the chance to earn back an entire shopping bill. In addition, Alipay users will receive preferential entry fees at The Dubai Mall’s popular attractions, including Dubai Aquarium & Underwater Zoo and KidZania. With more than 70% of The Dubai Mall’s stores now accepting this payment platform, shopping is more convenient than ever for Chinese visitors. The Dubai Mall’s Chinese New Year live entertainment schedule is below for your reference. Timings are subject to change.